The school year has come to an end and summer vacations for the family begin. Every year thousands of people choose the coast of the Spanish coast to spend a few days of rest and leisure with their loved ones. In this way, the everyday life of the working life for the elderly and the studies for the youngest ones is put to an end and the long days of beach, of sand castles, of baths until sunset, of games on the seashore begin . They are moments of happiness in families, memories that will last forever in our memory. And, of course, Conil is a perfect place for a vacation with children. Its wide and extraordinary beaches represent an ideal scenario for all these activities, for this reason year after year many families choose it as a tourist destination. In addition, to this offer, a series of varied attractions for family leisure is added, where fun for adults and children is guaranteed. Sport, adventure, mystery, speed, are the four exciting proposals that we bring to this post and that will not leave your family indifferent. The beaches of Conil have special characteristics that make them ideal for beginning the practice of these water sports. And it is that in the municipality there are several specialist schools in creating authentic surfers. We bring you some of them. With more than twenty years of experience, the South School of Conil O’Neall, located in the vicinity of the Salado River, offers courses for hours of Surfing and Kitesurfing and SUP paddle surfing. It has a license from the Junta de Andalucía, the City Council of Conil and the title of Active Tourism. On the other hand, the Vertigo Surf Camp offers several options, a camp the Surfcamps, where to live the experience of surfing from within, or simply enjoy their different courses. Open all year round, the Conil Surf Academy offers courses aimed at all those people who want to learn this sport quickly, safely and fun. The school has modern facilities in the same town, where the theoretical part is taught. 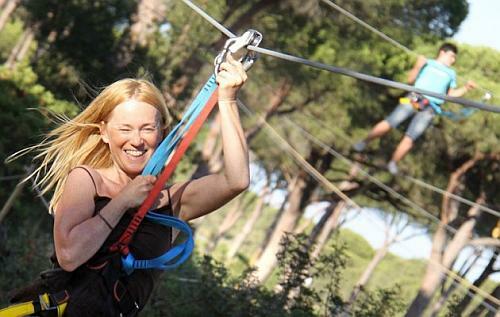 In the appreciated pine groves of Roche is Entre Ramas Aventura, an adventure park of 18,000 square meters for the whole family. It consists of a tour of the trees, doing various activities such as zip lines, suspension bridges, Tibetan bridges, etc. In total there are 70 games spread over 7 courses or circuits that progressively increase in level, from beginners to the more adventurous. This park has extensive security measures, controlled by a specialized team of monitors. The participants receive a training course to learn how to use the individual protection equipment that allows them, with total security, to move independently between the trees. Entre Ramas represents a unique opportunity to enjoy a great day of fun in the middle of nature with the whole family. Located in the center of the municipality, this proposal is a Scape room, the game that is triumphing all over the world and that consists of trying to solve a mystery or enigma to escape from a room. In the activity proposed by Enigma Conil, a group of 2 to 6 people enters a room and have a time of 60 minutes to get out of it. To do this, they have to solve a series of mysteries and challenges that will test the physical and mental abilities of their participants and encourage teamwork. Its organizers emphasize that the only requirement to participate in this game is to have fun. It is a quiet and smooth activity, in which strength is not necessary and, therefore, is suitable for all audiences, they point. Speed lovers have a date at the KR24 Circuit. On the road from Conil to El Palmar, there are these magnificent karting facilities, which have an excellent outdoor track within walking distance of the wonderful beaches in the area. All family members will be able to test their skill as kart pilots in different types of cars. In this way, junior karts are intended for children and are characterized by being safe and reliable, and doubles are ideal for the family. And for those who like the strongest emotions, Kart24 Conil has more powerful models. Its facilities also have a free children’s playground, a bar area and a restaurant with barbecue. Without a doubt a place, KR 24 is a space to enjoy a perfect day with the whole family during the holidays in Conil de la Frontera. And where to stay during this family vacation to enjoy all this fun? Well, Villas Flamenco is the perfect accommodation to meet and have fun with everything that Conil and its surroundings offer. Villas Flamenco, which has the best rental houses on the Costa de la Luz, wants you to experience all these exciting experiences with your family. Therefore, it has launched some offers that are irresistible: Villas Flamenco the first child under 12 years is free (see conditions). In addition, if you book 45 days in advance, you will get a 7 percent discount (check conditions) and if you do it two months in advance the savings goes up to 10 percent (see conditions). Do not think it anymore! Come with all your family to Villas Flamenco, the best destination for a holiday. Book now: last accomodations availbale in Conil for July and August!